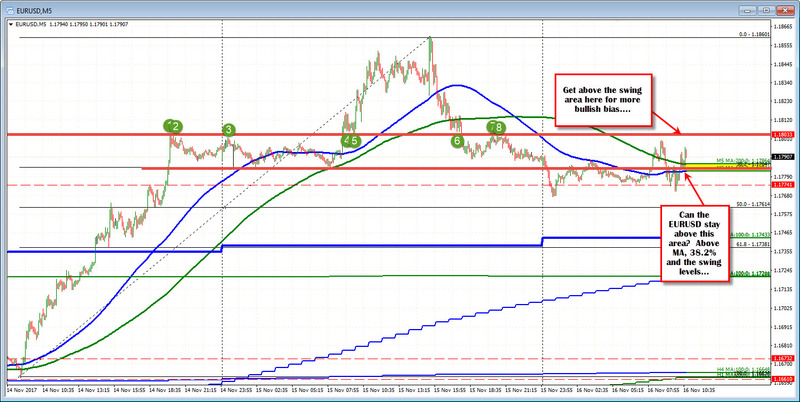 The EURUSD is consolidating in a narrow 33 pip trading range as the market decides higher or lower from here. Looking at the 5-minute chart above, the pair bottomed on Monday, trended higher to the Tuesday high at 1.1860 and then started a rotation lower - moving below the 100 bar MA (blue line) and the 200 bar MA (green line) in the process. The action today has seen the price move - and stay - below the 100 bar MA (blue line in the Asian session). The action over the last few hours has seem more choppy price action. The price has traded above and below the MA lines. At some point, it will decide lower or higher. The barometer may be those MA lines. We currently trade just above the lines (well trading right at the levels as I type). This will be a test for the buyers or the sellers. Do we hold the lines and rotate higher? The 1.18033 would be a level to get above (should open the upside for further gains). Or does the price dip back below the MA lines, and make a play to the downside? The 1.1774, the 1.1761 (50%) and the 100 day MA at 1.17433 loom below as targets. Eventually, the market will decide the fate. Right now it is fighting it out with neither the buyers or sellers winning.